Myers Hall is one of the older residence halls at Drexel University and is home to most of the learning communities. It was renovated in 2005 and is unlike most traditional dorms. It is the shortest dorm on campus with only three floors, but is by far, the widest and longest residence hall. Myers’ unique layout consists of separate wings with a central courtyard. It has the traditional room style with two students to a room. Males and females live on the same floor, but in separate wings of the building. Students with the same major typically live with each other. Their wing is also typically full of students in the same major. Each floor has two wings, a central area, lounges, communal bathrooms and showers, and full kitchens. Myers Hall has a unique, sprawling layout with several wings on each floor. Each wing has a full kitchen, bathroom, laundry services, and a study/social lounge. The hallways are long and seemingly interminable. It can take some time to become familiar with the maze of a layout that Myers has. Navigating the building can take some getting used to. The first floor of Myers has an open lobby with vending machines, a game room, and a tutor lounge. The game room has a big screen TV, pin pong, and a pool table. Study sessions and social events are often held in the tutor lounge. The first floor also has a big courtyard that is open to all residents. It is a fun area to hang out and relax. Since it is only three stories tall, Myers does not have an elevator. The rooms in Myers Hall are the second biggest out of any traditional style dorm rooms on campus. On average, they are 11 feet by 17 feet; this allows for a lot of space to bring in extra commodities. 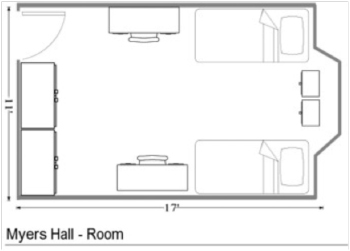 Each resident is given a bed, desk with a chair, wardrobe, and dresser. All of the furniture is moveable so they can be positioned however the resident feels. One of the nice things about the rooms in Myers is that every room has a large bay window area. This is very nice because it adds extra space and allows a lot of light into the room. The rooms all have self-regulating heating and air conditioning. The doors to each to do not shut and lock automatically like the ones in Kelly Hall. They can be left open or left shut and unlocked. Each wing in Myers Hall has a communal bathroom. They contain toilets, sinks, and showers. They also have a full kitchen with table and chairs, lockers, stove, oven, freezer, and sink. One of the nice things about Myers is that it has a laundry room in each wing. This means that less people share the services and it is easier to do your laundry. It is very convenient because residents do not have to walk to communal laundry room. The washers and dryers are free, so students do not have to pay for them. There is big lounge in each wing that can double as a study or social meeting place. It has a big table and chairs so that residents can study. The layout of Myers’ floors allow for a lot of interaction between students. It gives the residents a sense of community. The fact that residents live in communities of students with the same major makes it a very nice atmosphere to live in. The learning communities also create a down side, however. There is no diversity of majors in the wing that residents live. This can mean that students do not spend much time with students outside their particular major. Myers Hall is home to about 400 students all together. The building is very secure like all the other residence halls and is well maintained. Students must scan their ID to enter the building and there is always staff working the front desk. The recent renovations have given Myers Hall a renewed, pleasant atmosphere. There is a community feel among the residents in Myers that is not present in other dorms on campus. It is located right in the middle of the residence halls and only a stone’s throw away from the North Side Dining Terrace. Its address is 3301 Race Street. The staff is very nice and makes for a pleasant place to live. 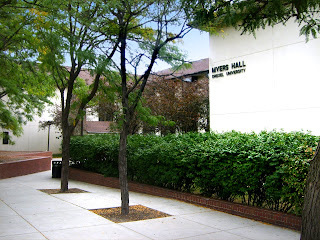 Overall, Myers Hall is very nice and offers its residents a lot of advantages. I live in Myers and avsolutely love it! The learning communities allow students in the same college to do work together and bond; however, because there are different learning communitites throughout the building you get to meet plenty of people in othermajors as well. I would definitely reccomend incoming freshman to live in Myers.